Welcome to LatinCarib Real Estate Network, your real estate experts for Mayan Riviera real estate in Akumal, Tulum and Playa del Carmen real estate. Please look over some of our most popular Mayan Riviera real estate listings. As well as search Playa del Carmen real estate for sale and search the entire Mayan Riviera MLS. Playa del Carmen Lots for Sale - This is a great new community just south of Playa del Carmen. New Playa del Carmen Studios for Sale - New lofts and studio condos for sale in Centro area. The LatinCarib Network specializes in Mexico Mayan Riviera real estate buyer's agent services .... as well as Mexico Residencies, Relocations, and Taxes. We have a variety of listed and unlisted real estate investments in the Mayan Riviera. We have various property development land, condo hotels, a well as a Riviera Maya hotel for sale in Akumal. See a sampling of land and Riviera Maya property investments. Again, many of our property investments, land listings - from beachfront land to development land - are not listed. They are pocket listings where the owners are also open to JV's, etc. 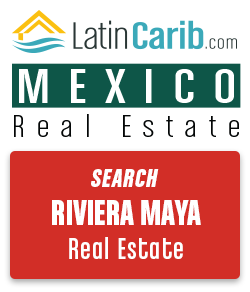 Please feel free to search Riviera Maya real estate listings in the Menu above. Or click on the link below. And contact us to see more about our services - and how we can help you find your perfect piece of Mexico real estate.